When building out the original IP, 9 Lives, we started developing characters that we felt would be cool for people to play. 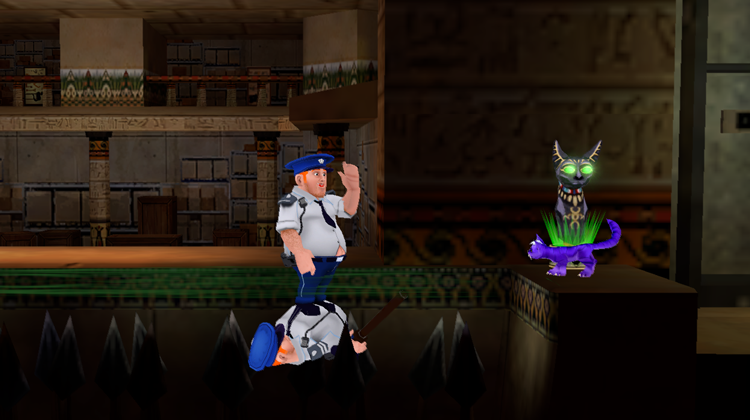 Originally Casey was a small boy who hid out in the museum and smashed the idol of Bastet thus getting 9 Lives from Sphynx. But upon further thought and discussion with friends the thought of putting a small boy to death was a little daunting, so Casey the security guard was born. The original artwork for Casey, was put together by a good friend of ours, Mike Grills. Mike had also worked at BioWare with some of our crew and personally I knew Mike from working with him at Empire Avenue. Mike’s style and speed are awesome and with a brief on the basic story and a bit of Mike magic, Casey took his first illustrated steps. 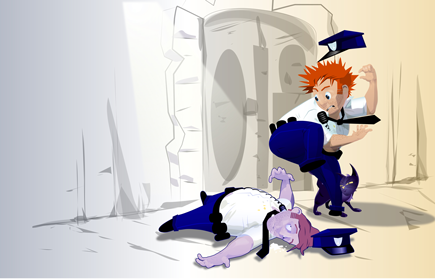 While the look and feel of Casey did not really change from those initial illustrations, the man who brought him to life, in game, was Christopher Mann. Chris has been in the game industry for over 12 years working at BioWare and Gameloft to name a couple. An early Casey can be seen below coming to life and celebrating a small victory. In parallel Casey needed some background love and some awesome writing so we leaned on our friend and ex Bioware collaborator Cookie Everman, who gave the characters back stories and started bringing out their character with conversations. See Cookie’s blog for more info on how they came to life. The way we portray personality and story telling in game is through still sequences and banter in game. 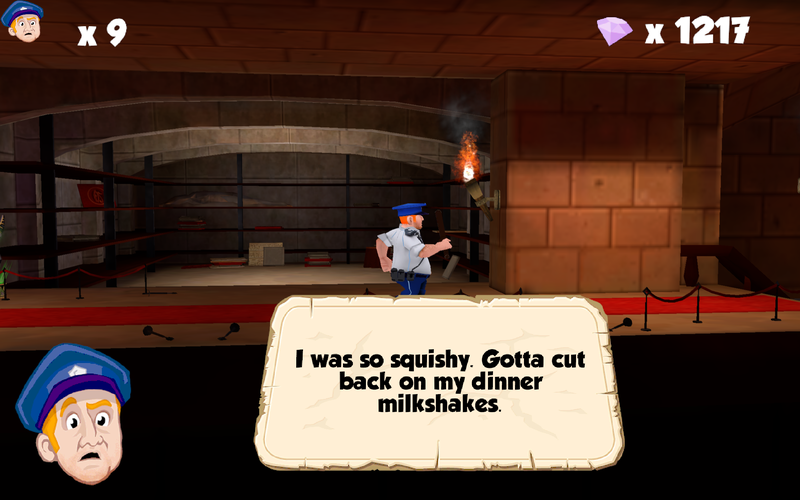 Coming off of a tiny budget all banter is written text and we hope to be able to add VO to the game over time, but part of us says leave it to the player’s imagination as to how the characters are portrayed. We really hope you enjoy playing Casey in the game. 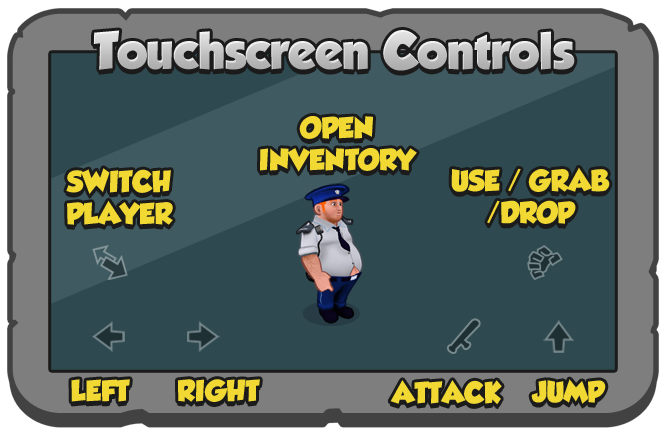 As we get close to launch we wanted to touch briefly on controls for the game. We have partnered with our friends at Green Throttle and the game runs really well using the Green Throttle controller in both single and co-op player modes. We really think we have done a great job of showing how fantastically well the Green Throttle (GT) controller works in a co-op situation, kicking back on the couch with friends. We are also aiming to have Ouya, Gamepop, GameStick and other Android “unconsole” builds shortly after launch for those who have them. 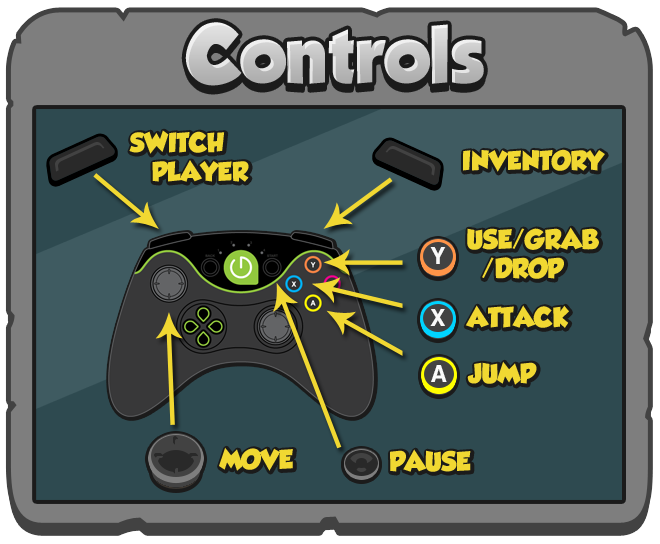 We also spent a lot of time working with touch controls and debating how best to have a game experience that was fun for those who did not have a GT or uncosole at home. We did trial total touch gameplay where, similar to old school RPG’s, pointing and clicking on a mouse equated to touching the direction you wanted the characters to go, but it just didn’t feel right. So we are launching with a touch experience, which for the old school gamers amongst us, it plays like an old school DS game on the tablet/phone. We believe this is great as it encourages a mobile gameplay experience while on the move and then if you have an “unconsole” being able to play your game when you get home or by plugging in your mobile device to your TV via cable. 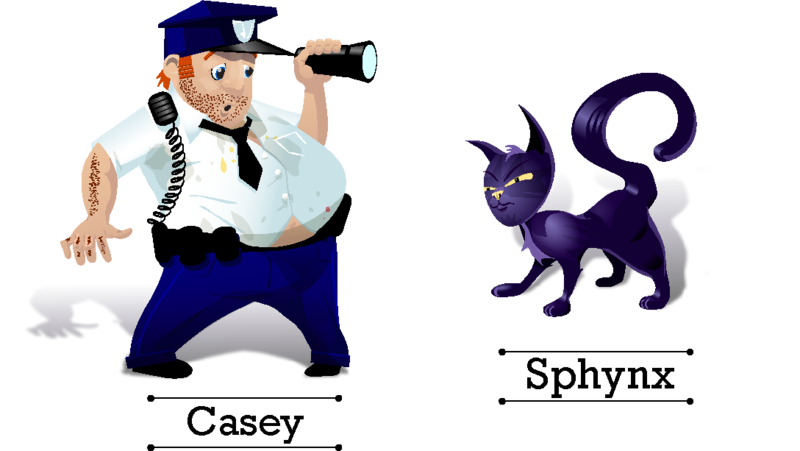 9 Lives is getting close and will be available on Google Play and Amazon stores soon. “No Pain, No Gain!” is the famous saying, so can the ultimate pain, Death, be the ultimate gain? Back in the arcade game days, game design became all about killing the player within 2.5 minutes, therefore, making the player spend more money. With free to play games going in a similar direction in 2013, design based on killing the player to encourage more and more money to be spent is now prevalent, the concept of death to progress became even more interesting to us. What if you could design a game where death happens on purpose, and in fact you need to die to progress? Especially if you combine that concept with the dichotomy of reducing the number of deaths to score higher points and be rewarded for replaying the level in a faster and smarter way, not just on your own but with a friend without losing the excitement and fun of killing the player in fun ways. This is our challenge with 9 Lives! We have designed and are building 9 Lives in a way that will test the single and co-op player to solve the puzzle using sacrifice. We have found that sacrifice is fun, it creates moments of hilarity between players that we didn’t think would occur, the unpredictable behaviour of even your best friend, or son in my case, created fun game moments, that to be honest I have only really experienced in a few titles. This brings a whole new emotion to griefing! We will talk about more of the elements of 9 Lives as we head towards launch. When we thought about writers for this project we couldn’t go further than a great friend of ours Cookie Everman. today Cookie fills us in on her thoughts on Casey and Sphynx. It’s the Casey and Sphynx Show! Many writers will tell you that their characters talk to them and direct the course of the story they are writing; that was certainly true for me. When I first met Casey and Sphynx five months ago, they were just your average bumbling security guard and sassy stray cat. All I knew was that they had both fallen under an ancient Egyptian curse and had to work together to find the pieces of a broken idol and break the curse. As I began to write their story and dialogue, they each began talking to me in their own unique voices, telling me how their story was going to unfold. Casey is to Sphynx as Homer is to Bart. He’s not the sharpest knife in the drawer, but he generally has good intentions. Casey’s life hasn’t gone exactly the way he had anticipated, and he relies on the women in his life, like his Granny, to give him direction. So when he meets Sphynx, she bosses him around straightaway and he doesn’t hesitate to follow her lead. A lot of his dialogue centers around him not wanting to disappoint Sphynx by messing up their mission. Sphynx was getting bored with being immortal and Casey’s accidental theft of her nine lives is an exciting and exasperating change of pace. This feisty feline has been around for centuries, she’s super smart, and her caustic wit cannot be denied. Many of her sharpest barbs are directed at Casey, especially when she is frustrated that he has lost another life trying to solve a puzzle, but I tried to make sure that she didn’t cross the line from sassy to mean. 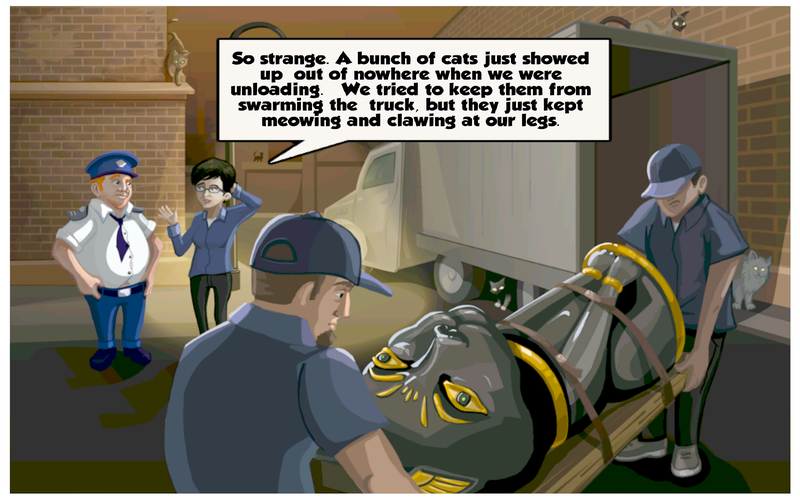 As you play “9 Lives: Casey and Sphynx”, I hope these characters speak to you in their own way. Enjoy the Casey and Sphynx show! Cookie Everman is an accomplished writer and mom from the sunny climes of California with roots in Hawaii, and now residing in Seattle. We are lucky enough to know Cookie from our days at BioWare where Cookie brought characters to life in ways only gamers understand. It is official that Cookie is awesome and therefore receives the Horace nod of the antler as a cool human being. 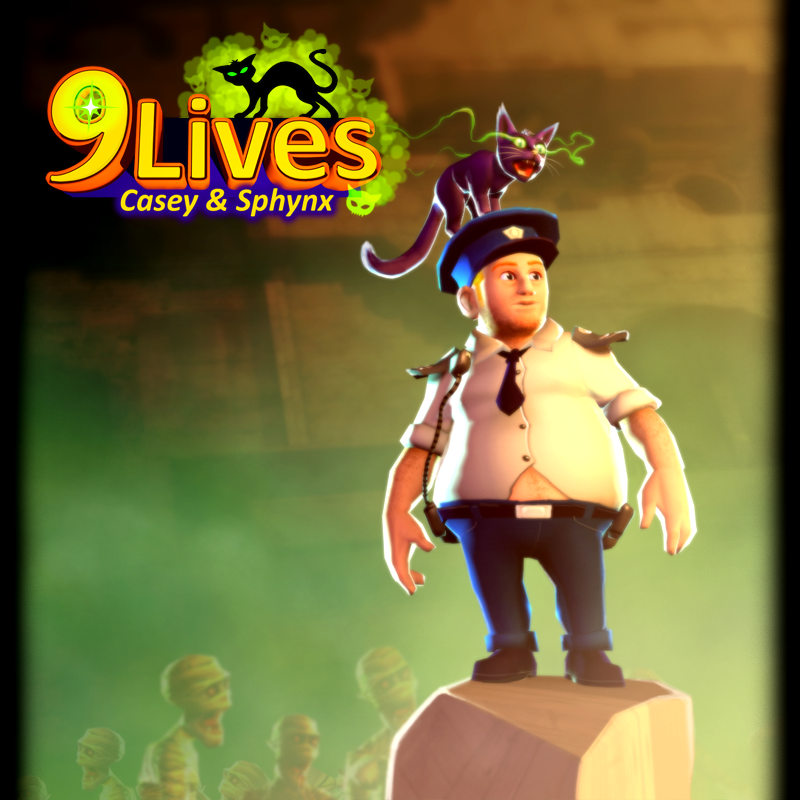 As we head towards the launch of our first game, 9 Lives: Casey and Sphynx, I wanted to start talking about who we are, what the game means to us and the studio in general. Today is the first blog in that series and we will be having some guests along the way talk about their input into what we are doing. When putting together Hungry Moose Games, our initial fear was that if we talked about our past, ie having worked at BioWare, the expectation from some of the fans and the media would be epic games of 100+ hours, in RPG universes like Mass Effect and Dragon Age. How could we live up to our previous employer’s legendary status within the game industry and still stand up and say we used to work there? Rather than hide from it, I want to surface my thoughts on what our philosophy is around what we bring to the table from BioWare; I personally worked at BioWare, as director of marketing from 2007 – 2010, from when Mass Effect was in full scale production until Mass Effect 2 launched. I took two things from my great experiences: Quality Culture and Story telling through characters. It is no secret that Quality = BioWare. 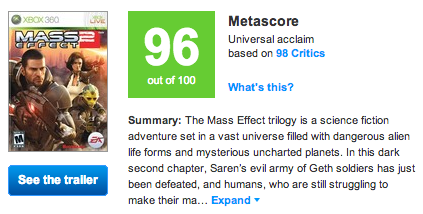 When I was there the quality average over 15 years of games was the best in the industry, Mass Effect 2, is still sitting at a 96 today. The culture at BioWare was very open, any person could talk to anyone about what they were doing, and in marketing we heard a lot of feedback from the development community about not being open and rushing things. This philosophy really drove excellence and feedback loops that made everyone better. Initially I struggled with it coming from more corporate closed cultures. When you learn that everyone’s opinion is valued, I think it somehow made a big studio feel smaller. Experts are still respected and have the final say but it doesn’t mean that that an accountant couldn’t talk to Drew Karpyshyn about the latest Mass Effect storyline. Storytelling … when it is implemented well, story is the awesomeness of most single player games I play. 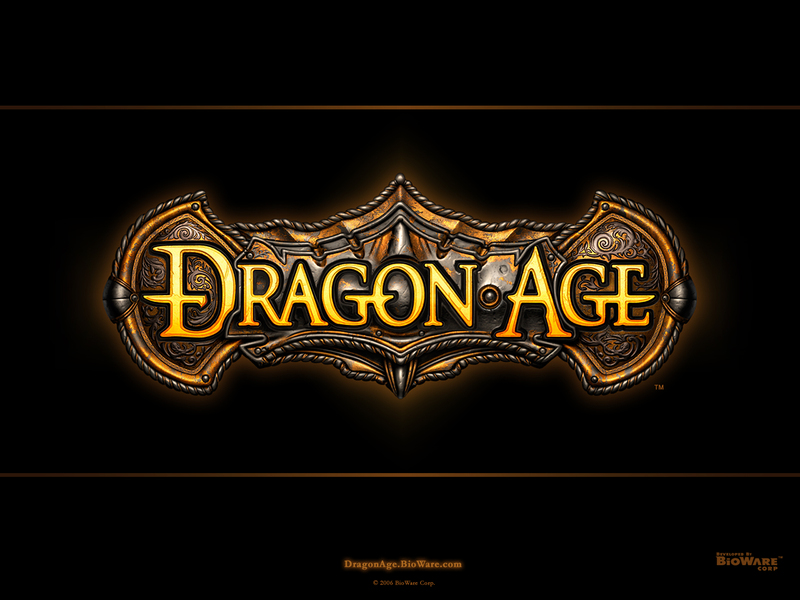 BioWare had been creating great story based games for a long time before I arrived and I was but an observer in the process. The amazing ability of teams to get together to create amazing characters and the great banter that then created awesome memorable gameplay moments is, I believe, something that BioWare does better than anyone else. The way that character progression and relationship progression was the narrative and that then drove great stories. We hope to bring that side of narration to our games, not in a story choice way, for now, but in a way where great character’s banter and interact in subtle ways to build out their back stories and the overall game story and therefore the player’s relationship progression with the game. Once again to call it now, we are not building 100 hour epics with branching story lines and story choice mechanics, but bringing characters to life using our experience in building them. Cookie Everman, a friend and member of our team, is writing for us and will drop in soon to give us her take on our two characters. Our games will be simple, and if we execute well will create hours of fun for those who play them on whatever device they choose.